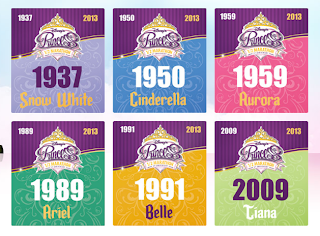 I've been anxiously awaiting the release of the 5th anniversary Disney Princess Half Marathon medal. Although I will not be running this race I wanted to share the medal and an amazing contest that our friends at runDisney is putting on. The only reason I am not running this is due to a joint graduation trip/ family vacation to New Orleans (and running the NOLA Rock and Roll Half). So here she is - the 2013 Disney Princess Half Marathon 5th Anniversary Medal! It features FIVE Pink jewels, a tiara and a touch of pixie dust. I am so sad that I will not be at this race but I had to put others before me this time around. 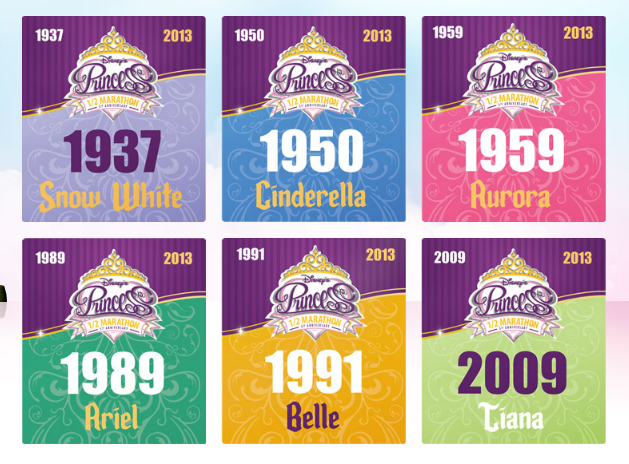 Enter at www.runlikeaprincess.com to play a Facebook game, where you pick your princess through various Disney Bibs. You also have a chance to win gear, gift cards and race entries from Lady Foot Locker and runDisney. I selected Ariel but didn't win today. You can come back everyday for another opportunity to win. For those on the fence to sign up for the race, it is currently 78% full. Historically, races fill up after the medals are revealed. Sign up by visiting Run Disney's website here. The medal is so so so beautiful! And a chance to stay in Cinderella castle? I die!! !